Life is a big struggle for many women in Kenya. Ann is no exception. She dropped out of school to care for her siblings following the death of both parents. This young woman is now caring for her own daughter alone. Her husband left upon discovering that their child was disabled. Ann makes ends meet by doing laundry for paying customers. This was becoming increasingly difficult as she needed to carry her daughter with her. At 8 years of age, the daughter was becoming so heavy that Ann could barely manage to carry her to work. 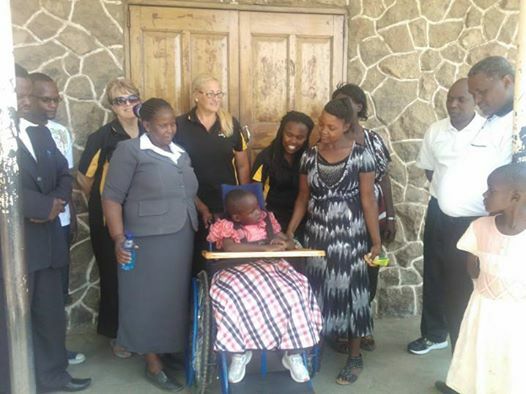 KH met her at a clinic in October 2013 and arranged for a suitable wheelchair to be made. Ann was so overwhelmed and grateful for this gift that many tears were shed.